If I thought preparing papers and projects and planning (alliteration unintended!) for finals last week was crazy-busy, boy was I in for a treat this week, which I spent GRADING the papers, projects, and exams previously assigned, finalizing quarter grades, and working on next quarter’s curriculum. In other words, it’s been a tough, exhausting week. 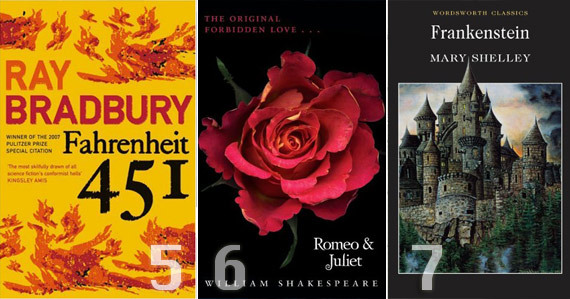 Thankfully, second quarter brings about the unit study over one of my favorite pieces of literature to teach in high school, Romeo and Juliet (#6). Before we discuss our favorite tragic, Elizabethan-era tale (unless you have another? ), we’ll start with an excellent, spooky, perfect-for-fall read. I’ve got to admit that, true to its creature, Frankenstein can be a real monster to teach. Shelley is just a teeny bit…verbose, we’ll say, and she has a irritating habit of meandering her way miles off topic. The philosophical battle raging in Victor’s mind is analyzed to the extent that the natural drama and intensity of his horrible dilemmas and subsequent moralizing tend to be softened through over-description and repetition. 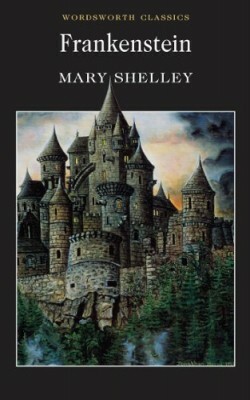 I will give Mary Shelley her proper dues, but I’m not sure it’s the most highly-crafted and well-written classic out there. So why is it on my list? To begin, no other novel hooks a student as quickly as this one does. I usually find a way to name-drop this novel in class a few times prior to reading it, and students are certainly pumped up and ready to go when the unit begins. It’s also, naturally, much fun to time around Halloween/the start of winter; everyone’s really feeling the mood and atmosphere Shelley establishes, and students look forward to – and actually fully participate in – class discussions. A lot of this participation stems from the fact that the moral/ethical issues in this book are still very relevant in today’s age, perhaps even more so than in Shelley’s, so fabulous discussions are almost always a given. The best part, however, might be that because the novel is so long and dense, students feel a real sense of accomplishment and confidence when they finish successfully – and that’s a great way to begin second semester. I had to make a terrible, terrible choice this year. As I’m now teaching in the block schedule (semester-long vs year-long classes), I was informed that I needed to choose whether ninth graders would read Caesar or Romeo and Juliet. After my initial cry of BOTH was quickly nixed by my fear of throwing too much Shakespeare at freshman in a period of eighteen weeks that also happened to include the Odyssey, I finally decided on the good old Capulets and Montagues. 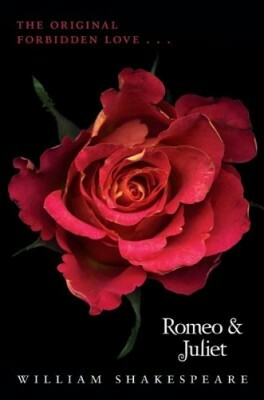 After all, what high schooler has not read – and loved – Romeo and Juliet? Wouldn’t I be committing some kind of literary sin if I caused 60 students to miss reading this play during their high school career? I just couldn’t take any chances. Also, I’ve had a pretty high batting average with this one as students seem to universally enjoy reading the play, and I always have fun with it as well (although I will say not all teachers love teaching it, oddly enough). Obviously the language is beautiful and addicting, the drama shocking, the romance swoon-worthy, etc. It’s a good one, folks. And showing clips from the modern, Verona Beach set Leonardo DiCaprio version (which I find completely accurate as well guilty-pleasure thrilling) is not exactly a bad perk, either! It could be my rebellious, controversial side that loves this book so much, but I always find it just fantastic. The futuristic setting, controlling government, and society made numb and dumb by too much technology and not enough reading and genuine thinking/feeling make for one relevant and worthwhile read. 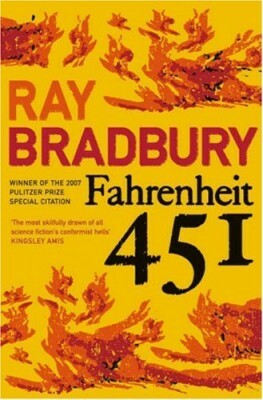 Our current society would love you to believe that any problem nowadays is solvable by an app or a pill, and most of Ray Bradbury’s writing is eerily prescient. The narrative is taut and tense (Mary Shelley could take some tips) and the ending is probably one of the most satisfying, fervent ones I’ve read – so satisfying that I’ve seen it in one version or another many different places, including The Book of Eli. One quibble: some filmmaker out there, PLEASE update the film translation of Fahrenheit! The only movie version in existence is simply hideous (and not in an awesome way – okay maybe a little, but not in a way that could be truly appreciated by high schoolers!) However, I think it has the potential to be a phenomenal film. Finally, a last little note about my experience teaching this book: the first year I taught Fahrenheit (my first year of teaching), I requested and ordered the book to teach as I remember loving it as a student myself. When it arrived and I read it again, I got quite the shock – after some of the works I had taught, it seemed to be way too scandalous, language-wise. I was so nervous about students reading all of the bad language that I personally went through with a Sharpie (I had a small class that year), tracked all the page numbers that featured the profanity and marked out the major offenders! Yes, yes, I know – I censored a book about the societal dangers and the evils of censorship. On the plus side, I also taught a killer lesson on irony that day. Six down, four to go! What do you think will (or should) be next? Do you remember reading any of this lit in high school? It’s been fun reminiscing about some of my favorite teaching experiences – after all, my love for literature is what got me into the field, and as an adult, these selections continue to prove some of my most valuable reads.